The beautiful flavors of garlic and Asiago cheese star in these made from scratch dinner rolls. Learn how to tie these simple, delicious garlic and Asiago twists in just three steps. Your family will love eating these rolls during the holidays or at your Thanksgiving meal. This post was originally published on December 22, 2017. A couple months ago, Mom and I were watching a baking show where the baker was making baguettes with caramelized garlic in the dough. He was saying that you wouldn’t even want traditional garlic toast after eating that bread! Neither Mom nor I had ever heard of putting garlic in a bread dough, and we both thought it was a fascinating idea. This bread is definitely for the garlic lovers out there! There’s a lot of fresh, pan-fried garlic that goes into this dough; just over 1/2 cup. Interestingly enough, the garlic’s naturally spicy flavor mellows significantly with cooking, so don’t worry about getting garlic overload! The crispy, golden brown garlic smells so good as it’s cooking, that you will need to sample some. Another reason to increase the quantity! Roll each piece into a 12-inch rope. Tie in a loose knot. Wrap the ends around the loop of the knot, tucking them into the center to form the twisted shape. Finely chop a large head of garlic, then fry it in 2 teaspoons of butter until golden brown, stirring frequently. If the garlic begins to stick to the pan, add 2 tablespoons of water to deglaze it. While the garlic is cooling, measure out all the ingredients for the dough. Stir in the garlic powder, dried basil, chopped parsley, and chopped rosemary. Add the softened butter and half of the water. Stir everything together with your hand to start forming a dough, then gradually add more water as needed to create a soft, slightly sticky dough. Make sure to pick up all the flour from the bottom and sides of the bowl. Knead the dough for 10 minutes on a floured surface until the dough is smooth, stretchy, and not as sticky. See if it’s kneaded enough by breaking off a lump of dough and stretching it between the thumb and forefinger of each hand to create a windowpane shape. The dough should stretch until translucent without breaking; if not, knead for a minute or two longer and check again. Place the dough in a lightly greased bowl and cover tightly with plastic wrap. Let it prove (rise) in a warm place until doubled in size, about 1 hour. Your dough should look like this when it’s done proving (rising). Now, turn out the dough onto a floured surface and punch it down all over to knock out the air pockets. Sprinkle the cooked garlic over the dough, then knead until it’s evenly distributed in the dough. Roll each piece into a rope at least 12 inches long. Tie the rope into a regular knot. Wrap the ends around the loop of the knot, tucking them into the center, to form a twist. Place the twists on a parchment-lined cookie sheet, cover, and let prove in a warm place until noticeably increased in size, about 45 minutes. The dough should spring back when gently poked with a fingertip. Here’s what they should look like when they’re done rising. Bake the twists at 400 F for 25-30 minutes, until they’re a rich golden brown and have an internal temperature of 190 F.
Quickly peel the garlic by vigorously shaking the cloves in a mason jar until the skins come off. Make sure that the salt doesn’t touch the yeast directly; it can kill the yeast. Use warm water (110-115 F) to make the dough. This will encourage the dough to rise faster. Don’t want to twist the rolls? Just roll them in balls and bake them in a greased 9 by 13-inch pan at 400 F for about 20-25 minutes. Store the leftover rolls in a zip-top bag at room temperature for up to 12 hours, or freeze for long-term storage. Craving more homemade dinner rolls? These recipes will be real crowd pleasers. Soft and Fluffy Sweet Potato Dinner Rolls: these beautiful cloverleaf rolls use up leftover mashed sweet potatoes. How to Make Fluffy Dinner Rolls: these classic rolls are guaranteed to be a hit. 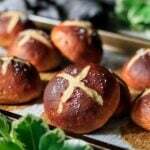 Laugenbrötchen: these German pretzel rolls are soft, chewy, and addicting. Did you make these garlic and Asiago twists? Please leave a recipe rating below to share how you enjoyed them. Melt the butter in a small skillet over medium heat until bubbling. Add the garlic and turn the heat down to low. Cook until golden brown, stirring frequently, about 15 minutes. Deglaze the pan with 2 tablespoons of water or white cooking wine if necessary. Set aside to cool. Rinse, pat dry, and finely chop the fresh parsley and rosemary. Pour the bread flour into a large mixing bowl. Add the salt and yeast on opposite sides of the bowl and stir in each with your finger. Add the grated Asiago, parsley, rosemary, basil, and garlic powder and stir to combine. Dump in the butter and half of the water and begin to stir and crush the mixture to form a dough. Gradually add more water and continue to work the dough until all the flour is picked up and a somewhat sticky dough has formed. Shape the dough into a ball, place in a lightly greased bowl, and cover tightly with plastic wrap. Let the dough prove in a warm place until doubled in size, about 1 to 1 1/2 hours. Line an 11 by 17-inch metal cookie sheet with parchment paper. Turn out the dough onto a lightly floured surface and punch it down all over to knock out large pockets of gas. Flatten the dough and dump the cooled, cooked garlic on top. Fold the dough over the garlic and pinch to seal, then knead until the garlic is evenly distributed in the dough. Divide the dough into 12 equal pieces, using a kitchen scale for accuracy. Roll each piece into a 12-14 inch rope. Tie the rope into a loose knot and wrap the ends around the loop of the knot to form a wreath shape. Place each twist on the prepared cookie sheet and put the tray inside a clean garbage bag, tucking the excess bag under the tray to seal. Let the dough prove inside the bag for about 45-55 minutes, until the dough springs back when lightly prodded with a fingertip. About 15 minutes before the dough is done proving, preheat the oven to 400 F.
Brush the twists all over with beaten egg, then bake at 400 F for 20-25 minutes, until the twists are a rich golden brown and have an internal temperature of 200 F. Let them cool completely on a wire rack before serving. The proving times are approximate. The dough will prove more quickly in a warm room instead of a cool room, so be sure to check the dough often if it’s in a really warm place. For optimal freshness, store the rolls in a zip-top bag at room temperature and eat within 12 hours of baking. For longer storage, freeze in a freezer bag for up to 1 month.